My main photography site is JimDoty.com with hundreds of pages of photographs and photography information. There are a lot of photography lessons in the Learn section. Jim Doty Portrait Photography is my new portrait site. You can learn all about me here. 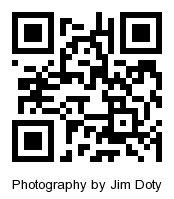 Scan the QR Barcode to go to JimDoty.com.